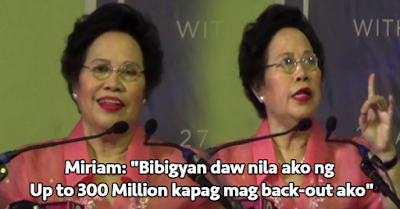 Shocking: Sen. Miriam Defensor-Santiago was Bribed 300 Million to Quit the Presidential Race! Senator Miriam Defensor-Santiago is one of the strongest presidential bets. She is known for being a frank, brave and articulate public servant. She also has a very unique charisma that made her liked by people especially the young ones. Since Santiago's admission of her true health condition, many voters doubted if she is fit to be the president. However, she said that she has taken a pill that could cure her cancer. She even attended the last PiliPinas debates and proved the Filipino people that she can finish the race. Santiago also has a message to those who are still in doubt of his competence. "For those who think that I should withdraw because I have once been a cancer patient, this is what I say, I am now normal. I can think and I can act and I can pray," she stated.